Thanks to Ato Boldon for pointing this out to me. 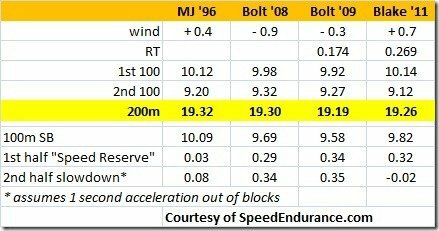 At the 2015 USATF Championships, the top 3 go the Worlds (assuming standard is met) unlike Canada with a complicated matrix of rules. But what if you came in 4th place, by a fraction of a second where your reaction time could have made all the difference between representing your country and staying home watching the meet on TV? I have great respect for all the competitors, but I could not help noticing how a better start, or more specifically, a better reaction time could have made all the difference in the world. Or World Championships. In the old days, the outer lanes in the 200m, 400m and 4x400m relay had the disadvantage being further from the gun. Today, speakers are provided behind the blocks so it’s a fair start for everyone. To refresh your memory, here is the race video on YouTube from 2011. Everyone, including myself, talked about Yohan Blake’s poor reaction time. If he had the same reaction time as his 100m performance in Daegu, he could have run 19.17 and broken the WR. Of course, it’ easy for me to talk about this after the fact, but the point I am making is every little thing counts at this level. The above chart also shows the incredible speed endurance of Michael Johnson and Yohan Blake. Usain Bolt is considered “normal”. Races are won or lost by percentages of less than 1%. 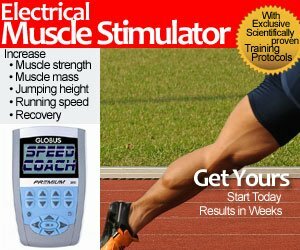 So, how do you practice reaction time without doing too many starts using blocks? And trashing your central nervous system (CNS)? I’m not saying reaction time, or practicing reaction time is not important. How much, and when to do it are my two biggest concerns. I’ve seen coaches practice endless reaction drills to their athlete prior to a race in the warm up area. One or two is fine, but 30 minutes of reaction time drills and starts is way to much. The drill I’m going to describe is not as destructive on the legs as doing real blocks. It simply practices the reaction time, and possibly getting familiar with the rhythm of the starter’s command. Of course, you should never try to cheat and anticipate the gun. Always REACT to the gun. Do not LISTEN to the gun. If I have the luxury, I take advantage of the prior heat IF you have access to the competition area, and do a “practice start”. Of course, the Olympic final is impossible. Some sprinters fuss about their block positions, but if you bring a tape measure, you are always guaranteed the right settings. And besides, they won’t start the race without you if your blocks aren’t ready.